The spiritual life of the Christian centers around the sacred Mysteries (or ‘Sacraments’). A sacred Mystery is any act in which the unseen Grace of God (His direct action and power) is invoked to act within a visible context. While it has been common in western Christian practice precisely to number the sacraments—this may largely be due to the debates between Rome and the various Protestant Reformers—it has not been the tradition of Orthodox Christians to number the Mysteries. That said, because of the confusion following the theological debates of the Protestant Reformation, it has been necessary for the Church to clarify its understanding, thus one will encounter lists such as this one. Nevertheless, it is important to understand that while these Mysteries stand out as especially significant, everything the Church does is considered sacred Mystery. Immediately before His Ascension into Heaven, Jesus Christ commanded His disciples to ‘make apprentices of all nations, baptizing them in the Name of the Father, and of the Son, and of the Holy Spirit.’ Baptism (Greek ‘to immerse’) began when Jesus Christ allowed Himself to be baptized by St. John the Forerunner, the Herald of Christ’s coming. At baptism, the new Christian dies to the old human nature, subject to death and sin, and rises out of the waters resurrected, cleansed of sin, renewed and transformed in Christ. Following baptism, the new Christian is anointed with a holy oil, called chrism, which is prepared by the Patriarch and many other bishops, upon which the Grace of the Holy Spirit has descended. This seal of the gift of the Holy Spirit is the new believer’s personal day of Pentecost. At the center of the Christian life is the sacred Mystery of the Eucharist (Greek meaning ‘Thanksgiving’). The Eucharist, also called Holy Communion, is the bread and wine offered up to God, transformed by the Grace of the Holy Spirit into the very Body and Blood of Jesus Christ, and distributed to all the faithful. Jesus Christ established the Eucharist shortly before His crucifixion. Declaring that the Eucharist is indeed His actual Body and His actual Blood, He commanded His disciples to continue to celebrate it. In partaking of the Eucharist, the Christian partakes of God Himself, and is transformed by union with Him, being cleansed, healed, and made holy. While baptism cleanses the Christian from sin and grants new life, the struggle against temptation is yet very real. Knowing that we have failings in our journey closer to God, we are given the opportunity to repent—that is literally, ‘to change our whole way of thinking and acting’. Not only do we repent and turn away from self-destructive actions, but we bring our admission of failure and our desire to change before God. In the words of St. James, “Therefore, confess your sins to one another and pray for one another, that you may be healed. The prayer of a righteous person has great power as it is working.” (James 5:16) Again, St. John tells us, “If we confess our sins, He is faithful and just to forgive us our sins and to cleanse us from all unrighteousness.” (1 John 1:9) As in all the other sacred Mysteries, because God is working within humans who are both physical and spiritual, this working is not only inward and invisible, but also outward and visible. In the case of Confession, the Priest stands as the visible witness and presence of Christ—the repentant Christian is not confessing sins to the Priest, but to Christ Himself through the Priest. The Priest, then, likewise declares the forgiveness offered by Christ and may offer spiritual counsel that leads to healing and to a spiritually healthy way of life for the repentant Christian. The Mystery of Unction, or Anointing is given for the healing of the body. 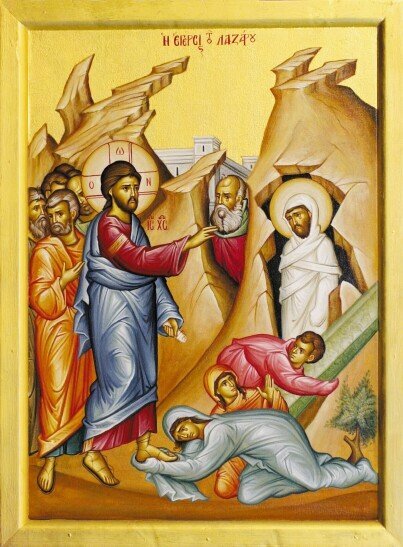 Following the admonition of St. James, “Is anyone among you sick? Let him call for the Presbyters of the church, and let them pray over him, anointing him with oil in the name of the Lord.” (James 5:14) In America, it is customary for all the faithful to be anointed on Wednesday of Holy Week, but Unction is given any time of year for illness or injury. In marriage, one man and one woman are united by Christ for the working out of their salvation. In marriage, the complementarity of the sexes fills up what is lacking in each spouse, so that each might learn to be holy and complete, living not for the self but for the other. This process is difficult, because it involves giving up selfishness and one’s own agenda—indeed, it is precisely this movement away from self-gratification, enabled by the presence of Christ in the marriage, that makes this union powerful for salvation. Thus, marriage is based not on the cartoonish ‘love’ depicted in romance novels and movies—this ‘love’ is actually a self-centered affection that enjoys the other only so long as the other makes one feel happy and fulfilled. Rather, marriage is about the Godly love, giving all of one’s self for the sake of the other—regardless of the other’s response. The natural outgrowth of such a complementary union is the blessing of children, which is humanity’s participation in God’s act of creation—husband and wife are called to be caretakers of these children of God, raising them in the Church and teaching them to love and attend to God in all their life. The order of the Priesthood goes back to the narratives of the Hebrew scriptures; even before God instituted the priesthood of Moses’ brother Aaron, there was the enigmatic figure of Melchisedek (Hebrew, ‘King of Righteousness’) whose priesthood St. Paul connects to Jesus Christ’s. (Hebrews 7) The Priesthood of Christianity is properly understood as Jesus Christ’s own Priesthood—certain men are called to participate in His eternal Priesthood through the Mystery of Ordination, or the Laying-on of Hands. Following the Apostolic model in the Gospels (e.g. John 20:22) and the book of the Acts of the Apostles (Acts 14:23), the candidate receives the Grace of the Holy Spirit through the laying on of the bishop’s hands. He is set apart to serve Jesus Christ in His Church, guiding the people of God, teaching, praying for the whole world and administering the sacred Mysteries. Again, we might easily have included the Funeral and Memorial Service for the departed, the Blessing of the Waters, the Blessing of any object, the Consecration of a Church, the Tonsuring of a Monk, the Coronation of an Emperor, etc. to be Sacred Mysteries. Nevertheless, we have explored only these select few. The sacred Mysteries form the pattern for an Orthodox Christian’s life in Jesus Christ, by the Grace of the Holy Spirit.